In stock -This product will ship today if ordered within the next 4 hours and 41 minutes. For hair that is normal to dry, a medley of lavender essential oil, quinoa protein, aloe, babassu oil and vitamin E work together in harmony to cleanse and nourish every strand. The result: hair is soft, smooth and shiny. This bottle is made with 100% recycled material and contains organic ingredients. No GMOs, parabens, harsh sulfates or preservatives, synthetic colours or fragrances, phthalates or animal testing. Aloe Barbadensis Leaf Juice(1), Aqua (Water), Coco-Glucoside, Sodium Laurylglucosides Hydroxypropylsulfonate, Glycerin, Heptyl Glucoside, Xanthan Gum, Citrus Aurantifolia (Lime) Oil, Citrus Limon (Lemon) Peel Oil, Lavandula Angustifolia (Lavender) Oil, Calendula Officinalis (Calendula) Flower Extract(1), Chamomilla Recutita (Matricaria) Flower Extract(1), Chenopodium Quinoa Seed(1), Lavandula Angustifolia (Lavender) Flower/Leaf/Stem Extract(1), Tocopheryl Acetate, Alcohol(1), Babassu Oil Polyglyceryl-4 Esters, Bisabolol, Citric Acid, Inulin(1), Sodium Chloride, Benzyl Alcohol, Potassium Sorbate, Sodium Benzoate, Coumarin, Limonene, Linalool. Gently massaging into wet hair produces a rich, cleansing lather. 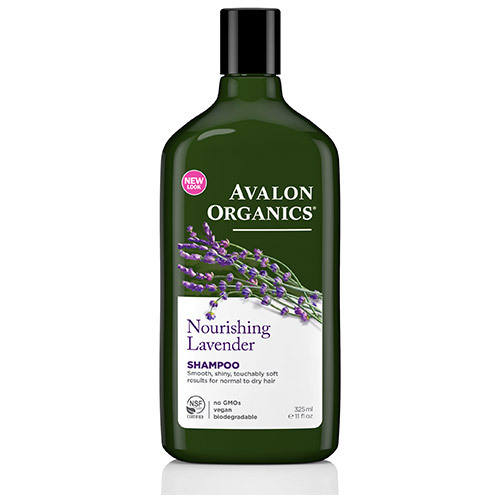 Below are reviews of Avalon Nourishing Lavender Shampoo - 325ml by bodykind customers. If you have tried this product we'd love to hear what you think so please leave a review.